The O’Flaherties of Aughnanure Castle, whose ancestors formerly possessed the barony of Clare, were hereditary enemies of the De Burghs and were constantly at war with them. The De Burghs besieged the castle of Aughnanure, which surrendered after a long siege. The O’Flaherties were forced to pay an annual tribute of corn, cattle and wool to the De Burghs and their heirs forever. Young O’Flaherty on his fathers favourite horse, Deelish, soon passed Dangan, reached the western suburbs of Galway, and having entered the town by St. James’s Gate, passed through In-Sparra-Hier, crossed the West Bridge under the middle and inner gates, rode up through Bridge Gate Street, Market Street, Goal Street, High Middle Street, when turning to the left, he passed through Little Gate Street and out by the Abbey Gate in Blake’s tower, and soon reached the outer fortification of Tirellan. Throwing the bag containing the head of young De Burgh into the courtyard, O’Flaherty galloped again through the town. The De Burghs crossed the river to intercept him at Newcastle which they reached just as O’Flaherty was riding past on Deelish. One of the pursuers threw his spear, which missed the rider but pierced the horse’s flank. Deelish, however, pressed on until through loss of blood fell dead on Borenacranny Hill. The De Burgh followers on reaching the top of the hill were surprised to meet a large O’Flaherty force. The Earl’s men were driven back and of those who had crossed the river few lived to return. 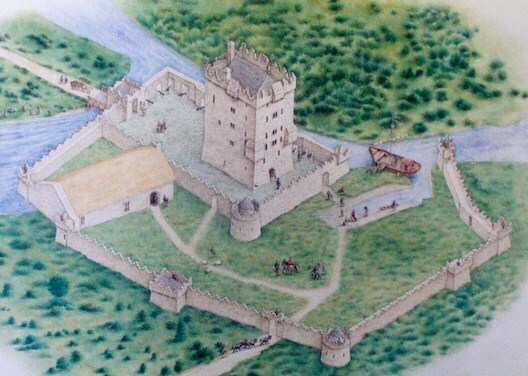 De Burgh never afterwards felt safe in Tirellan Castle, so he erected a new castle two miles beyond Galway to the north, furnished it expensively and took up his residence there. He decided that old O’Flaherty of Augnanure would have little difficulty in attacking him in his new home as it was only necessary to break down the road that led from the Abbey Gate to Tirellan Castle in order to make a passage for his galleys. He spent only one night in his new home, which received the name of Castlegar, and removed to Portumna, which became his principal residence. 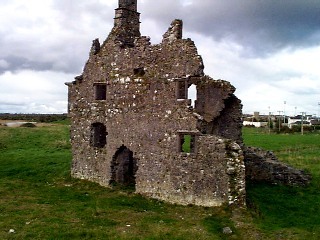 Tirellan was burned to the ground by the Irish garrison during the siege of Galway in 1691. My last name is Lafferty and we are decendents of the O’Flaherty’s! I was BLESSED to get to go there about 6 yrs ago and I never get tired of looking at pictures of the Castle! I couldn’t afford to stay very long and My DREAM would be able to spend TWO WHOLE WEEKS there but my finances will not support that! THANK U SOOO MUCH FOR THE PICTURES!! !